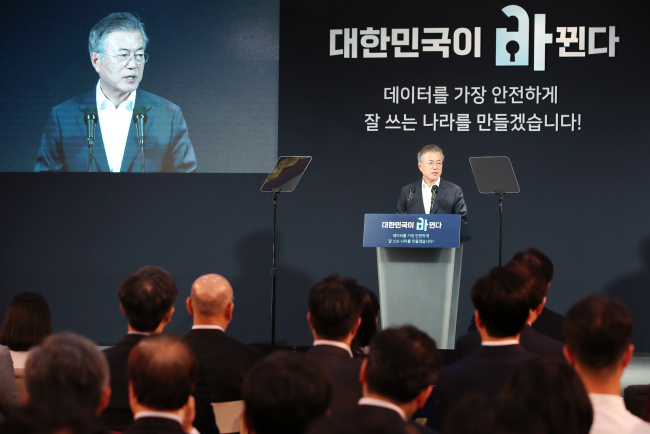 President Moon Jae-in vowed additional government support for the data industry Friday, stressing the need to develop big data into the country's new growth engine. "The government will fully support the data industry as part of efforts to revitalize our economy. We will establish a new expressway of data in the era of data as we built the Gyeongbu Expressway in the era of industrialization," the president said. His remarks came in a meeting with some 120 officials and representatives from the data industry, held in Pangyo, just south of Seoul. The meeting was also aimed at discussing the removal of excessive government regulations that the president said may impede the development of the new industry. "Now, the Republic of Korea must become a nation that best handles the Internet, a country that best processes data," Moon told the meeting, noting the country ranked 56th out of 63 countries reviewed for their digital competitiveness in a recent study by a Swiss college. At the meeting, the government announced plans to invest 1 trillion won ($899 million) in the data industry next year. Moon called for stepped up efforts to more quickly develop the new industrial sector. "The future of our innovation-led growth (strategy) lies in data. Removal of regulations related to the data industry must be quickly completed for the development of new industry and new technologies," he said. "I again stress that speed and timing are important." Still, the president also stressed the importance of efforts to better protect the privacy and other personal information of the people. "The importance of protecting personal information can never be overstated," he said. "Under any circumstances, the government will work to expand the use of data, but more actively protect personal information by enhancing safety measures," the president added. Also Friday, the government said it will spend 80 billion won to build 100 big data centers across the country in 2019 as part of its massive investment in big data and artificial intelligence. In addition, Seoul said it is seeking to come up with measures to make the most of personal data by making sure individuals are not identified in the process. South Korea lags behind other developed nations in terms of utilizing and analyzing big data. It ranked 56th out of 63 member states of the Organization for Economic Cooperation and Development.